We offer a wide range of Logistics and Courier Solutions that are receipts or acknowledgments issued to the customers as a proof of the services availed by them from the service provider. These solutions are generally used by Courier Companies, Post Offices, etc. The secret behind the effectiveness of Variable Data direct marketing is that the personalized pieces not only capture attention, but back it up with content relevant to each unique recipient. Backed by modern printing techniques, we are offering Variable Data Printing Service, as per the clients’ specifications. In the specified process we accomplish our printing task in relevance to customers’ needs & requirements, so that solutions offered to them must be up to their expectations. Our experts carry out the designing procedure with stringent approach and accomplish their assigned tasks with in promised time frame. 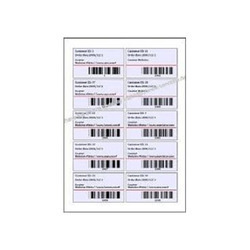 Since our inception, we are engaged in presenting a wide range of excellent quality Barcode Printing Service. In the process we are supported by experienced professionals and the complete assignment is accomplished under their surveillance. We offer service with relevant information as given by our customers and make our modest attempts to bring forth effective and attractive barcode results at the end. For perfect execution and our promptness towards customers’ queries, the provided service is asked widely among several organizations, corporate houses as well as business firms. Leveraging on our in-house production unit, we are presenting a wide assortment of Bill Printing Service. This service is used in banking deposits, firms, account organization and a variety of commercial market places. The offered service has figures, information, and details about the banks and customers printed on the face and back. Our printing machines are well advanced in processing such service. 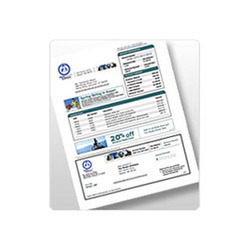 As a result, clients can provide their own custom requirements for printing bill. Apart from this, industry norms are welcomed and clients can look forward to print own logos on envelop.